We manufacture indoor antennas. Our indoor antennas are made up of good quality raw materials, under the guidance of experts. They are highly durable and provide excellent performance even in extreme environmental conditions. 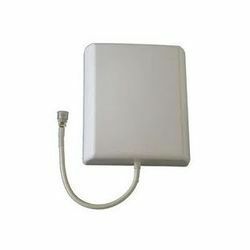 Our company holds vast experience in this domain and is involved in offering Indoor Antenna. Application: Indoor & Outdoor Mobile Signal Booster for GSM, CDMA, PHS, WLAN , 3G/4G & WIFI/LTE Network. In tandem with the ever increasing necessities of customers, we have come up with a comprehensive range of Indoor Antenna. Products for Inbuilding, Stadium, DAS, Small Cell and Point-to-Point Applications. Includes omnis, directional antennas, yagis, planar arrays and dish/donor antennas. 2.Wireless Communications and data transmission system Repeater. Ceiling mounted Omni Antennas used for point- to Multipoint communication in GSM / WLL / CDMA available for in building solutions and micro-cell application . This antenna can be operated in all frequency ranges is suitable for indoor coverage through Repeater distribution network to enhance weak signal. We offer Wide range of 2.4 GHz WiFi Indoor Omni Antennas.The antennas are designed for Optimal Coverage & signal penitration in indoor WiFi. The antennas can be deployed for warehouses, Fivestar Hotels, Hospitals & Airports Etc.